July 28, 2017 – East Dorset, VermontMarylisa Leffler of Brookeville, MD, won the $5,000 3’3” NEHJA Hunter Derby, presented by Eastern Hay, on Thursday, July 27, during the fourth week of competition at the six-week Vermont Summer Festival, running through August 13 at Harold Beebe Farm in East Dorset, VT.
One year ago, Leffler’s winning mount, Carlot, was carrying her over grand prix courses at the Vermont Summer Festival. This year, the 13-year-old Warmblood gelding is winning in the hunter rings. In only his third derby appearance, Carlot navigated tracks built by course designer Doug Russell of Ocala, FL, which spanned two competition rings and utilized both hunter-style fences as well as traditional derby jumps. From an original starting field of 25 entries, the top 12 horse-rider combinations in the standings following the opening round judged by Tony Sgarlata of Lake Worth, FL, returned for the handy round. Leffler’s first-round score of 84 brought her and Carlot back second-to-last in the order. They earned an 83, which was the highest score of the second round, and took the win with a final combined score of 167. Marylisa Leffler won the $5,000 3’3” NEHJA Hunter Derby, presented by Eastern Hay, riding Carlot on Thursday, July 27, at the Vermont Summer Festival in East Dorset, VT.
After earning the top score of 85 in the first round, Kirsten Malacarne of Wakefield, RI, scored a 75 in the second round to finish in second place with a total of 160 riding Kalifornia Dreamin’. Finishing three points behind Malacarne was Cory Hardy of Littleton, MA, with a total score of 157 after combing an 81 and 76 for third place riding Teddy. In fourth place, Merry Harding of Ridge, NY, piloted Conrido to scores of 76 and 80 to finish with a total of 156. Thirteen-year-old Morgan Budovsky of Rehoboth, MA, competed against professionals and amateurs alike to earn a top five finish aboard St. Elmo’s Fire. She earned an 80 in the first round and 75.5 over the handy course for a total of 155.5, as well as the high-point junior award. Alessandra Delucia of Darien, CT, was also recognized during the awards presentation as the high-point amateur after scores of 77 and 78 for a total of 155 placed her seventh in the final standings riding Say Goodnight. Of Carlot’s transition to the hunter ring, Leffler noted, “We decided this winter in Florida that he wasn’t happy being a grand prix horse anymore. We entered him in a low hunter class and I think he loves it! Leffler only showed Carlot in one class during the winter season before breaking her leg on March 1, 2017. While she was sidelined from riding, fellow hunter rider, Hunt Tosh, took up the reins on Carlot and moved the gelding up into the 3’3” and 3’6” divisions. 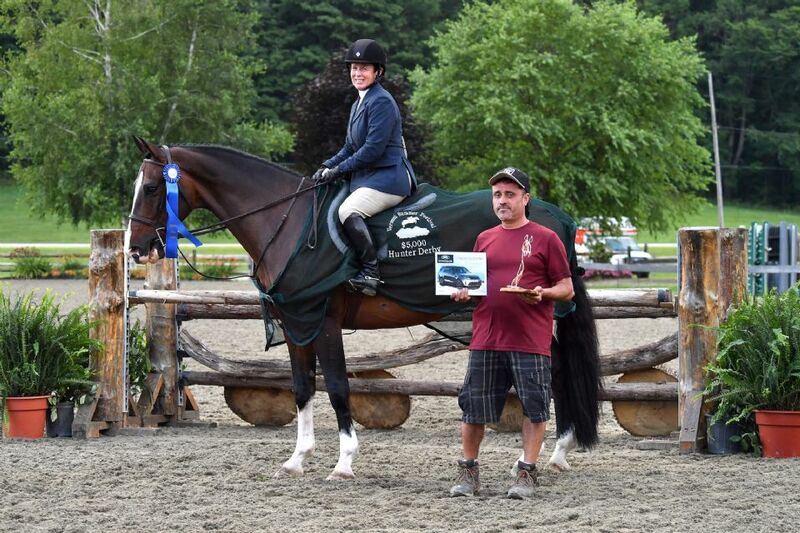 Marylisa Leffler aboard Carlot is presented as the winner of the $5,000 3’3” NEHJA Hunter Derby, presented by Eastern Hay, with groom Beto Silva on Thursday, July 27, at the Vermont Summer Festival in East Dorset, VT. In addition to her share of the prize money and a monogrammed winner’s scrim from Mona’s Monograms, Leffler was presented with a Land Rover Experience Driving School off-road excursion by class sponsor, Eastern Hay. 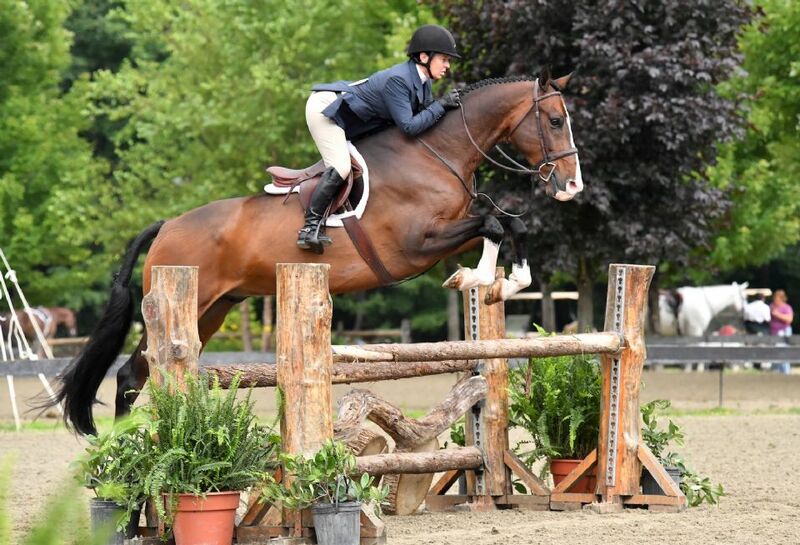 Competition continues throughout the weekend at the Vermont Summer Festival, highlighted by the spectator-friendly $30,000 Mount Equinox Grand Prix, presented by Johnson Horse Transportation, beginning at 1 p.m. on Saturday, July 29. For over 20 years, the Vermont Summer Festival has attracted exhibitors and their families to the Manchester region in southern Vermont for great competition in an ideal summer setting. Offering more than $750,000 in prize money over the course of its six-week run, the Vermont Summer Festival is New England’s largest hunter/jumper competition as well as the state’s richest sporting event based on purse. Outside the show ring, exhibitors are immersed in the charm of Vermont’s shopping, dining, and outdoor activities. Competition at the 2017 Vermont Summer Festival runs weekly from Wednesday through Sunday, beginning each day at 8 a.m. Admission is $6 for adults and $3 for children from Wednesday through Friday. On Saturday and Sunday, admission is $9 for adults and $5 for children with 100% of all gate proceeds benefiting the Manchester Community Library, Meals on Wheels of Bennington County, and the Rotary Club of Manchester.